Between 1910s and 1970s, folk song scholars, collectors and singers transcribed or recorded abundant examples of Irish-influenced traditional singing held over in the Great Lakes region from the days of live-in logging camps and fresh water schooners. The presence of instrumental music in old time Great Lakes logging camps is also well documented in photos and first-hand accounts but, sadly, very few transcribers or recorders bothered to capture any of the tunes! I decided to take a month off from the songs and share an interesting version of an Irish reel (usually called “The Five Mile Chase”) from Beaver Island, Michigan fiddler Patrick Bonner (1882-1973). Bonner’s fascinating fiddle playing was recorded. Alan Lomax recorded a dozen or so tunes from him in 1938 and Ivan Walton a dozen more in 1940. Bonner’s setting of “The Dublin Lasses” was one of some 80 or more tunes recorded between 1950 and the mid-60s by Edward “Edgar” O’Donnell. O’Donnell’s (low fi) recordings of Bonner are available online here. Patrick Bonner was the son of Black John Bonner, believed to be the first Irishman to arrive on Beaver Island after the fall of the island’s Mormon kingdom in 1856. Black John was born on Rutland Island (=Inis Mhic an Doirn), County Donegal not far from Arranmore (the birthplace of most first generation Irish-Beaver Islanders). His song Patrick was born on Beaver Island and lived there his entire life working as a farmer, logger and sailor and entertaining on his fiddle at “dances, picnics, weddings, and house parties.” Patrick Bonner’s playing is an intriguing blend of Irish fiddle style and a looser, simpler, more “American” approach. I highly recommend looking him up online to hear him for yourself! Sommers, Laurie Kay, Beaver Island House Party, (East Lansing: Michigan State University Press, 1996) 45. When the land of his fond loved home was nigh they had gathered around to see him die. Where the billows bound and the winds sport free, oh, bury me not in the deep, deep sea. I had had a string of inquiries lately about this song which Randy Gosa and I recorded on our Falling of the Pine album so it seemed like a good time to cover it in this column. The above version is closely based on one collected from Sarah Neilson of Hoople, North Dakota in the early 1920s by Franz Rickaby. Hoople is about 60 miles northwest of Grand Forks and about as far away as one can get from the deep, deep sea! Until I arrived at my true love’s gate where all my fancy lay. I was always resolved you would be my bride, but now, pretty girl, farewell. May the Lord above protect my love where all my fancy lay. We return again this month to another fine Irish song from the repertoire of Minnesota singer Michael C. Dean. 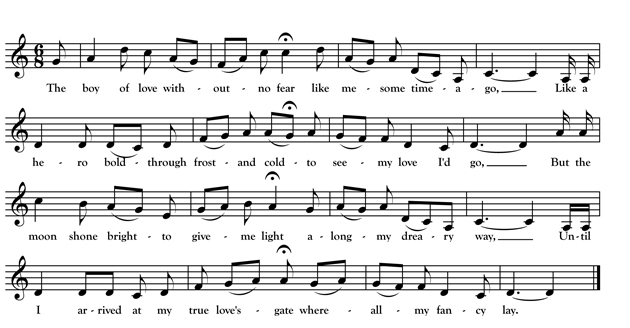 Irish song scholar John Moulden has traced this song, well known today in Ireland as “When a Man’s in Love He Feels No Cold,” back to its original composer: County Antrim schoolmaster Hugh McWilliams. McWilliams included “A Man in Love” in his book Poems and Songs on Various Subjects which was published in 1831 in Antrim. 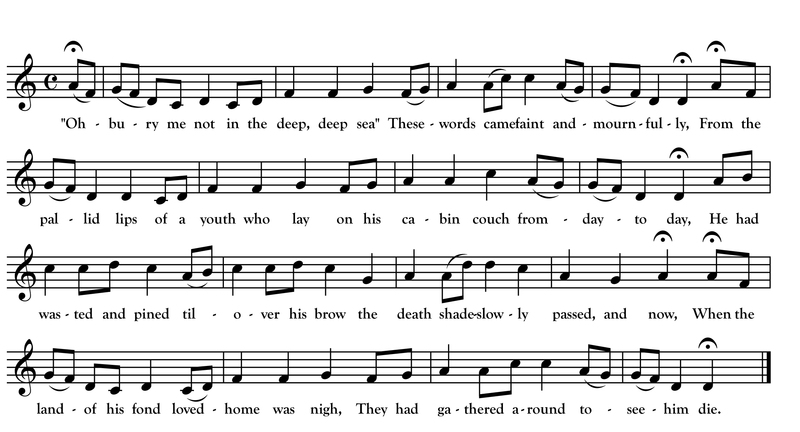 The song entered folk tradition where, over the next hundred years, it gained some words, lost others and was set to several different melodies. Dean’s “Minnesota version” provides evidence of the furthest distance the song traveled from its source. Since Dean left us only his text, I based the above melody on the melodies used for two other transatlantic versions collected in Marystown, Newfoundland by Maud Karpeles in 1930 and printed in Folk Songs from Newfoundland.